Leo The Maker Prince, is a new kid's book that tells the story of Carla, a boring accountant who always wanted to be an artist. 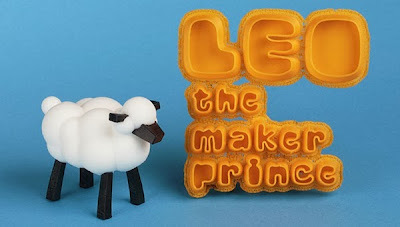 She then meets Leo, a 3D-printing robot, and together, they bring her creations to life. Cool storyline. But here's the kicker, All the characters and objects in the book can be downloaded from Thingiverse, and printed with a 3D-printer at home or through a 3D-printing service. Bringing kids together with the endless possibilities of new technology. How awesome?